Kim and I recently became season ticket holders, for a second time. For over a decade we’d enjoyed (on and off) season tickets to a football club in south west London, those going by-the-by when it became clear that a Saturday afternoon commute from Cornwall to SW6 would be out of the question. Our new season tickets, in addition to being much cheaper (how does £9 for an entire season sound?) are for a venue much closer to our new home, where the levels of intensity never waver and where scarcely a word is ever uttered, least of all in fervour. A place where disappointment is unknown and, unlike the not so reliable beautiful game, the spectacle is never anything less than engaging. 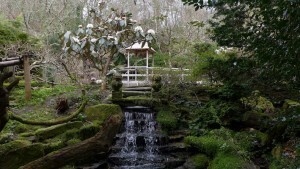 The Japanese Garden close to a Carmelite convent in the ancient village of St.Mawgan, within the verdant Lanherne Valley, exists only to make those who wander its serpentine paths, passing waterfalls and shrines, brushing bamboo, or stood upon bridges to gaze at a shoal of plump koi carp, feel for the lack of a better word, joyful. Nothing much happens there. In fact the garden is almost the antithesis of the Cornish holiday facility. There are no thrills, or pasties, and probably no Wi Fi either, and dogs are not admitted. It is, pure and simple, a place for quiet reflection. Somewhere to escape to. It’s the reason a friend of ours is also a season ticket holder. For her a place where she can get away from normal live. A place to read a book or write her diary. 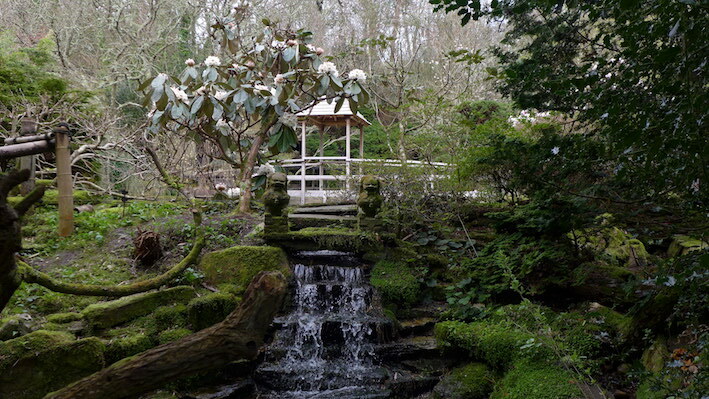 The Japanese Garden is lovely at this time of year (spring) when blooms of snow white cherry blossom nod in the breeze and the camellias reveal themselves. In a few weeks there will be canopies of Japanese maples and magenta azaleas, all reflected in the inert lake with a simple pagoda at the far end. The garden isn’t very big, probably no bigger than the football pitch we left behind. But with its screens and twisting gravel paths, plus the fact that like being in a library one automatically walks slower, treading softly and purposefully, it seems bigger than it is. 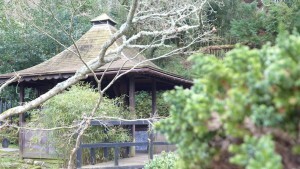 There are Bamboo and Moss gardens, a waterfall and Mountain (not a very big one). On our visit there was a man with long silver hair drawing images of Buddha on to poster size slates. And there is a Zen Garden with a shaded seating area overlooking a patch of raked white stones that has small Barbara Hepworth like boulders poking above the stone carpet like whales breaking the surface of the ocean, without a shred of organic life to be seen. Perhaps the only concession to commerce and tourism is the gift shop that one may visit without buying an entrance ticket to the garden. As you might expect there are more Buddhas on sale, in all shapes and sizes that you can shake a joss stick at. We bought a tiny one on a key ring as a gift. There are bowls and mats and miniature screens, and fans, and cards and lots of tiny trees from a few pounds to several hundred. These are bonsai, that I have now learnt, translates as ‘tree in a pot’. In a fenced off area there are spiky Japanese Larches and delicate Maples. Some hundreds of years old. There are indoor Bonsais too: Japanese Holly, Variegated Serissa, and perhaps my favourite, the Loropetalum with its delicate reddish/purple leaves. 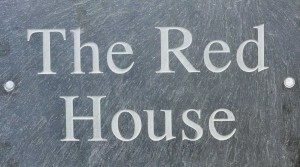 Admission £4.50, £2.00 (children), £4.00 (students). Season tickets (£9) for as many visits for one as you like. 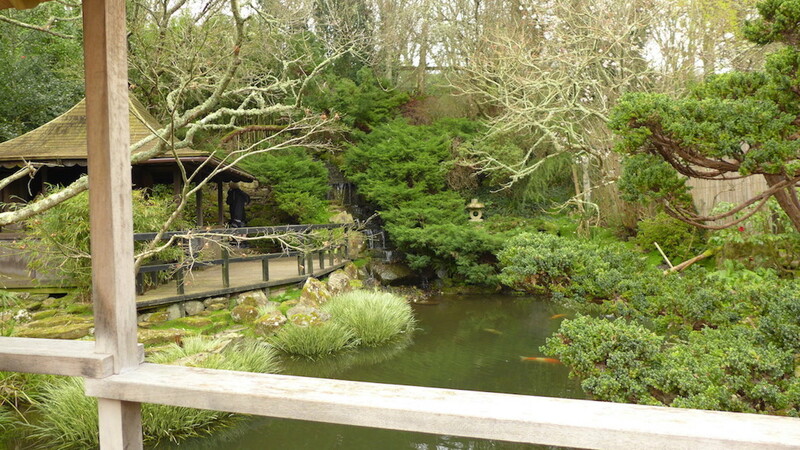 The Japanese Garden, St.Mawgan Village, Newquay, Cornwall, TR8 4ET. 01637 860116 .